Just 3 miles from home on a bicycle ride along Lake Washington Saturday afternoon and I started feeling light-headed. It was going to be a tough climb to my neighborhood. I had that “emergency” PowerBar with me, but really didn't feel like chowing down on 240 calories of chewy paste that close to dinner. Soon I realized the road was lined with blackberry bushes and ripe berries hung from the vines. This is an instant source of tasty energy. I was ready to go after eating about a dozen, but couldn't stop until I'd had about twice that many. There are several different types of roadside blackberries here in the Pacific Northwest. There are the native wild blackberries (Rubus ursinus) and the invasive noxious weeds — Himalayan blackberries and Evergreen blackberries. They all look pretty much the same to me and I don't know which I ate, but they were full of sugar and powered me up the hill. In Western Washington, the blackberries usually begin to ripen in very late July or early August and are good until the end of the month, unless all the vines are picked clean. 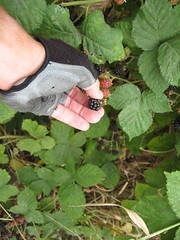 The berries are excellent for snacking during bicycling breaks because you can reach right in the plant with your gloved hand and not get scratched by the pesky thorns. You gently pry the berries from the stem; if they don't come off easily leave them alone because they'll be sour. The ripe berries nearly drop into your hand. I know what's in the PowerBar because it's all printed on the label. But what's in these blackberries? Generally, a cup of raw blackberries contains 62 calories, 7 grams of sugar and 8 grams of dietary fiber. One cup contains 50% of your daily Vitamin C requirement. In another measurement, four ounces of blackberries contained 43 calories, 4.9 grams of sugar, 21% of daily requirement of dietary fiber, 32% manganese, 35% Vitamin C, 25% Vitamin K and many other nutrietns. Blackberries are among the strongest antioxidant foods that can be consumed. The seeds contain polyunsaturated fats that are good for your heart. So next time I go out for a bike ride, I'm not going to wait for that light-headed feeling before stopping along the roadside for a meal. Maybe I'll take an extra water bottle and fill it with blackberries for some snaking later on at home.